In Catherine’s video series eCourse, she walks you through how to apply proper food combining principles to your current meal plan in just a few simple steps. These simple principles can gently cleanse and reset your entire digestive system, eliminate gas, bloating, indigestion, and take your health and weight loss to the next level. eCourse includes 5 tutorial videos, downloadable class notes, and 3 color food combining charts. Get Video Series eCourse Now! 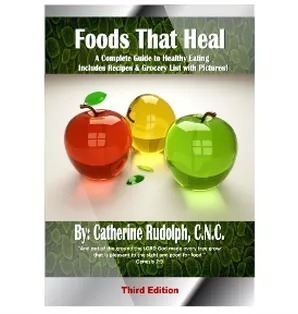 Catherine’s book Foods That Heal is an excellent way to get started with over 50 quick simple healthy recipes using proper food combining. I am feeling remarkably well and satiated. My swelling is seeming to be going down in my knees and ankle joints (which has plagued me since childhood). It's amazing, because I went almost a year and a half without any refined sugars when I previously did a candida diet, but I just felt depleted. But now the food combinations seem to really be helping. And keeping away from mixing fruit and oatmeal, and focusing on veggies as a main portion of dinner with a meat is working well. As much as I love sweets and pastries, I think that I'd really rather stay away if it means feeling so much less swollen and foggy. "Also wanted to tell you I've been doing great with your suggestions of protein, fats, fruits, veggies. And proper food combining. Hardly any carbs or sugar. My sugar cravings are gone. I've lost all my belly fat. Feel great. If I do try something sugary, I do it on the weekend and actually I don't even enjoy anymore. Like milk chocolate or a donut. Plus I get a stomachache. So i'm staying away. Oh and I've lost about 8 lbs which is a lot for me." I'm learning more about food combining from your book, and it's working. Before we met I struggled most days with terrible body aches, most of that is gone. And I really have had some terrible gut problems over the last 20 years and nobody could tell me what to do, and now my gut feels more healthy and I feel like getting up every morning and going to work!